Valak, the ghostly demonic figure haunting the Abbey, looks like a cross between F.W. Murnau's 1922 Nosferatu vampire and the theatrical shock-rock-metal 1990s Alice Cooper wannabe front man and singer Marilyn Manson all wrapped up in a nun’s habit. If viewers find this aspect scary, then the film is more likely to be scary. 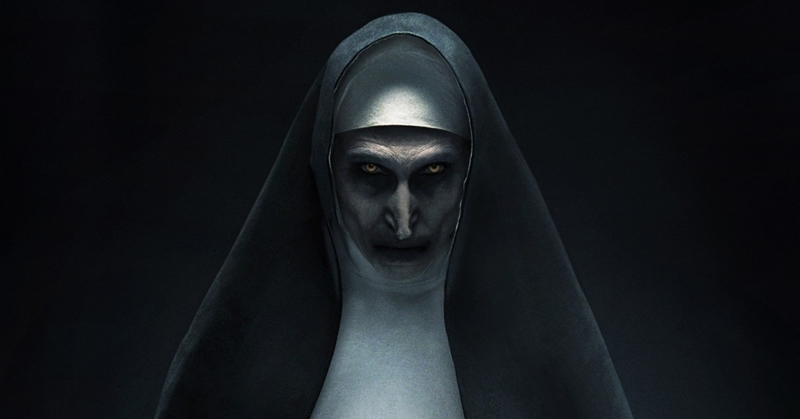 Wan introduced the Valak character in The Conjuring 2 (2016) where, as director, he made the nun’s sequences some of the most memorable moments. With that debut the evil nun was teased as a potential stand-alone film project as Wan had done with the ‘cursed’ doll Annabelle in the original The Conjuring (2013): the doll’s memorable cameo led to Annabelle (2014) and its sequel Annabelle: Creation (2017) which also teased Valak the nun. The pump was primed for this current Conjuring prequel and with promises of real scares. Sadly, The Nun doesn’t deliver on the promises. The film suffers from several problems from over-use of jump scares to an under-developed narrative and script. In addition, horror films work best if they follow the viewer home creeping into the dark corner of the viewer’s bedroom closet so when the lights go out and they’re crawling under the covers there’s a lingering sense of dread. For this to work successfully there needs to be a relatable hook in the story, something that makes viewers think twice long after the film is over. After Alfred Hitchcock's Psycho (1960) some viewers were afraid to take a shower in the house alone. Likewise Spielberg’s Jaws (1975) prompted second thoughts about going to the beach and swimming in potentially shark-infested waters. The Nun lacks this kind of hook because, for most of the audience, there is nothing familiar about a medieval castle Abbey. It’s as if the vampire in Bram Stoker's gothic novel Dracula (1897) never left the castle in Transylvania. The Nun seems trapped in the first four chapters of Stoker’s book never encountering the world with which the reader, or in this case the viewer, is familiar and where a demonic nun could appear standing in a suburban backyard at night. Where Francis Ford Coppola’s adaptation Bram Stoker's Dracula (1992) imbued Dracula’s castle with a certain operatic flair with colourful moments of gothic horror, The Nun director, Hardy, largely fails in achieving anything remotely similar in effect. This leaves The Nun a dim and drab looking movie with a brown and blue colour scheme that becomes a kind of visual white noise; the shadows are not full of fear as much as they are pregnant with predictability. This all adds up to a forgettable film never really getting under the skin of viewers. And for most people who enjoy these sorts of films that’s what they want: a movie that will get under their skin give them the willies and linger in their mind. The successful use of Christian imagery and symbolism in the horror genre generally and in this film, relies on breaking religious taboos and the corruption of pure things using blasphemous images or the degradation of what is believed to be good to illicit fear, terror, or at least unease. But there are only so many upside-down-bursting-into-flames-crucifixes an audience can see before they lose all effect. This approach relies on viewers having some religious piety of their own where they hold these Christian symbols and religious items in high regard. With the continuing shift in demographics and the rise of the “nones”—people who check the box for “none” on surveys of religious affiliation­—one has to wonder how much longer films like this will be economically viable. For instance, a headless Christ on a crucifix is only disturbing if the audience has any reverence for a crucifix and what it represents. If viewers have no faith in Jesus and Him crucified it will fall flat. William Friedkin's The Exorcist (1973) succeeded in gripping the public’s imagination in the early ’70s because it transgressed the boundaries of religious and cultural taboos still widely held in North America. Faithful Christians know that Scripture teaches that demons are real. The Gospel accounts report Jesus dealing with them personally, and people interact with them today regardless of what skeptical minds think about the supernatural. The Nun, while working to scare, decides rather to make its demons into cartoonish props for jump scares. This perhaps is why The Nun almost defies criticism; it never takes its subject seriously. If anything, Friedkin's The Exorcist was a serious film. Because this film doesn’t deal with Christianity honestly or treat the occult, the supernatural, or demons thoughtfully, it’s hard for audiences to buy in and suspend disbelief long enough to do the same. It also makes serious critique of the core subject matter sound equally silly. The Nun occasionally flirts with the kind of goofy campiness found in Roman Polanski's The Fearless Vampire Killers (1967) or Stephen Sommers' The Mummy (1999) or Sam Raimi's Army of Darkness (1992) but never fully commits to it. Clearly, The Nun doesn’t know what it wants to be. 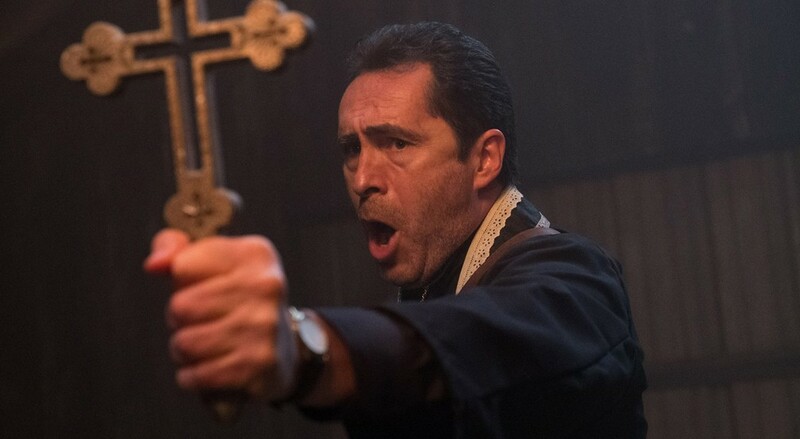 For a film advertised as “the darkest chapter in The Conjuring universe” The Nun can hardly commit itself to be a full-out campy schlock-fest.